Tehran announced Saturday it will unveil a new fighter jet next week, while the development of the Iran’s missile capacity will remain the country’s top military priority. 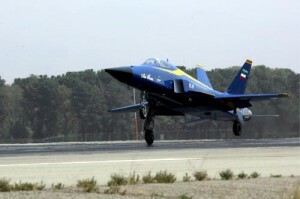 Brigadier General Amir Hatami said the jet will be unveiled Aug. 22 as Iran celebrates National Defense Industry Day. “People will see it fly, and the equipment designed for it,” Hatami told Fars. Also on Saturday, the Iran Navy announced that it had mounted on one of its warships a new defensive weapons system that would protect Iran’s naval destroyers against anti-ship cruise missiles. The announcements come amid rising tensions with the United States. Earlier this month, Iran launched naval exercises in the Strait of Hormuz while President Donald Trump prepared to reimpose sanctions on Tehran over the country’s efforts to develop nuclear technology, moves that sparked harsh tweets between Trump and Iranian President Hassan Rouhani. On Friday, the U.S. State Department announced it formed a group to coordinate policy toward Iran in the aftermath of the Trump administration’s withdrawal from the 2015 nuclear deal.